After having read much on this, and having seen many documentaries I believe it really took place one reason is that part of the Roman Ramp still exists now. I also think that many more of the Jews may have survived there were many other well hidden paths to and from Masada. We must remember that the Jewish Fighters were more or less radicals - Zealots. They all died for a cause they believed in, and their legacy will live on forever through the Jewish People of ISRAEL. In fact this is no news at all. It's been known for quite some time that the actual 'Jewish resistance' was in fact the faction of the Sicarii. The word sicarii is a Latinized term for the Arabic-Semitic word 'askar, which means 'soldiers'. Under their cloaks the Sicarii concealed sicae, or small daggers, from which they received their name. The Romans considered this an assassin's weapon. At popular assemblies, particularly during the pilgrimage to the Temple Mount, the Sicarii stabbed their enemies or, in other words, those who were friendly to the Romans, lamenting after the deed and thus escaping detection. Judas Iskariot may well have been a Sicarii. The other main Jewish group of insurgents were the Zealots, who attempted to expel the Romans and their partisans from Judea, even resorting to murder to obtain their objective. Another disciple, Simon 'the Cananaean' (a code-word for Zealot) may have belonged to that group, as may have James and John, who were nicknamed 'sons of thunder'. Even Peter could have originated in such a group, for he could have been one of the Bar Jonim ('Those outside the Law'). After the fall of Jerusalem, the Sicarii leader Eleazar ben Jair eventually succeeded in escaping the Roman onslaught. Together with a small group of followers, he continued his resistance against the Romans. From Masada, the Sicarii still made raids on the surrounding countryside, carrying off supplies. Josephus very clearly describes the wickedness and boldness of the band of robbers, who terrorised the countryside, killing or dispersing the inhabitants, abducting the remainder to Masada. 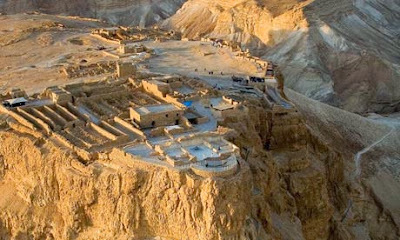 Masada never was 'Israel's Last Stand'. Quite the opposite, Masada was simply a robber's nest, filled with terrorists, opportunists and their wretched victims.